"Signing Statements: The Expansion of Presidential Power"
Student Handout: Viewing Questions -- Video Chapter: "The Battle of the Lawyers"
Developing Your Own "Themes & Analysis"
This lesson guide is intended for classes in social studies, civics and government, language arts, current events and history; Grade Level 9-12. 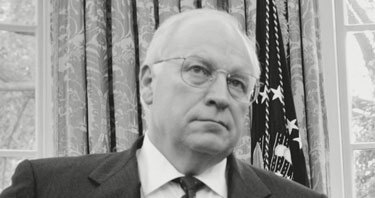 The guide examines the wide range of viewpoints on Vice President Cheney's role in the aftermath of the 9/11 attacks. It is constructed in modules, allowing teachers to use it either in its entirety or to select individual activities. The featured lesson is based on a video clip from the film. After viewing Cheney's Law, students will examine a range of viewer comments and share their own thoughts. Plus, a list of questions to discuss after viewing the film. Participate in discussions to reconcile possible differences in the policies of the two branches. Students will read and consider the comments from each of the interviewees on the Cheney's Law Web site, looking for variations in interpretation of presidential powers. As students construct a presentation on the history of presidents' actions in times of crisis, they will discover that many presidents from the early days of the republic have expanded their powers without the consent of Congress. Students develop their own "Themes and Analysis" section similar to the FRONTLINE feature on the Cheney's Law Web site. This teacher's guide was developed by Simone Bloom Nathan of Media Education Consultants. It was written by Greg Timmons, curriculum writer and educational consultant. Advisers were Ellen Greenblatt of The Bay School, San Francisco, and Debra Plafker Gutt, Stuyvesant High School, New York.